Diary of a Miner: Day 22: 4 DAYS UNTIL THE TASK FORCE ARRIVES!!!!!!! Day 22: 4 DAYS UNTIL THE TASK FORCE ARRIVES!!!!!!! FINALLY!!! HoN Co. sent me a further message concerning the rest of the book I found. They say that the book DOES make mention of the Lapis Lazuli stone as a catalyst for the reaction to allow Creepers to survive in harsh sunlight! I'd only found a small pocket of the stuff, and that teamed with the book meant an obviously dangerous mix! I don't know whether I should dispose of them, or keep them until the task force arrives... They also added that they have dispatched the task force, and should be with me within five days. It was actually sent to me yesterday, but didn't arrive until today, so they should be here in four days time! I've got everything ready for them; a secure wall, a peer to land on... I've messaged ahead asking if there is any need to provide additional assistance, but I probably won't receive an answer until it's too late! As I possess both the book and an active ingredient for the reaction, I'm quite worried that the Creepers - or something/someone else - will come after me! If the book itself is imbued with a specific power, then whoever wrote it may be able to track it! In which case, they've known where I am located... and have done for some time! This meant that I was going to have to pick up the pace for the building of the wall! I had already achieved so much, but I was worried about the rest of it. The main worry being how to gain access to the actual wall walkway! I decided to implement two ideas: have a quick and direct route from the beach head straight onto the wall, and have a walkway leading from my house onto the wall. The latter was more dangerous, because if something could get onto my wall, it could get to the house no problem! I decided to make use of the wooden walkway I had already made quite some time ago, and extended it downwards to reach the wall itself! Within a few hours, I had the entire area connected, illuminated and secure! 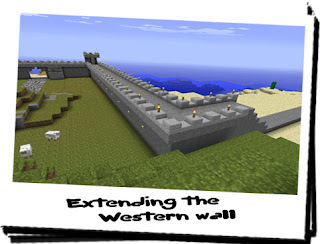 I was incredibly happy with this system, as it allowed me to travel directly from my house to the Eastern side of the wall. My main worry however was getting quick access to the South facing wall - the wall facing the sea! As there was no cliff or hill close to this, it wasn't as simple as extending a bridge across, so I needed a quick and direct route to the top of the wall. Then it hit me: elevator! A simple elevator system, making use of the pistons I was going to use for a gate! I had the housing of the elevator erected in no time, but the actual wiring of the system took longer than expected. It seems I'm not so great when it comes to pistons... I'm a dab hand with a fuse and TNT though! A little after midday I finally had the wiring ready, and the piston was connected to a simple one-push button. After testing it thoroughly, I blocked the wiring in to stop it being damaged by the elements, and then gave it a real test! It worked great. It quickly propelled me onto the wall with just enough force to not cause any damage to me... or the system itself! Now that I had that finished, I had the rest of the wall to concentrate on. Although I still wanted to implement a gate system at some point before they arrived, so I was only able to spend a small amount of time on the wall. After extending the Western wall, I noticed that I'd have to further extend it so that it didn't intefere with the trees that I had planted, or the walkway I used to get from the house to the forge! This meant changing direction entirely and following the beach again, parallel to the water. I continued the wall along this way for a good 150+ metres until I was sure I had cleared the tree line. I decided to leave it there for the moment due to the lack of torches on the wall. 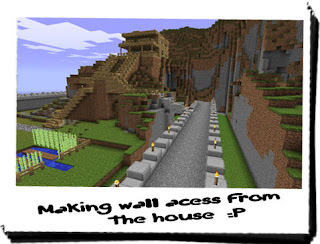 The last thing I wanted was strange zombies and Creepers finding a way onto the wall! I placed torches all along the length of every wall I had created so far, continuing with the alternating side for each torch. After I had the set length for the wall just about right, I returned to the house. Then it occurred to me: would a watchtower be better than just a standard tower? With this thought in mind, I've once again been distracted by thoughts to extend the towers on the beach-side wall so that I could use as proper look-out posts, and maybe even a landing beacon for the ship! I really think that the gate will never get planned at this rate, let alone built! But I'm hoping to feel a lot safer in four days when the task force arrive! 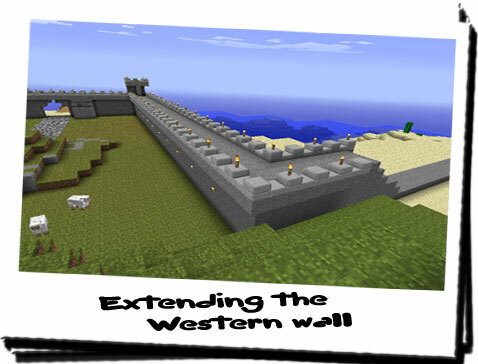 With the current wall erected, I actually feel safer than I have in a long time! Probably since before I found the book! I have yet to plan what awaits my day tomorrow though! Watchtower/beacon, or piston-activated gate?